Every once and a while I feel like having a hot dog or two! 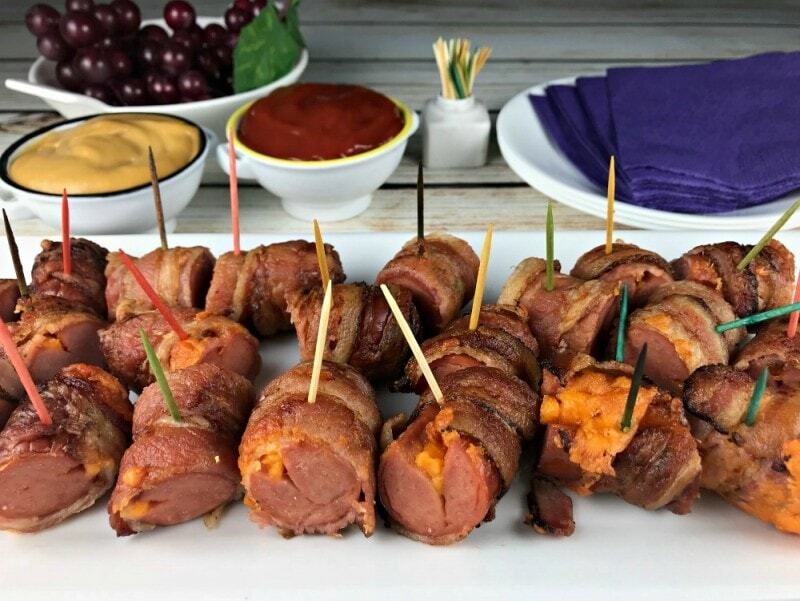 These Cheesy Bacon Hot Dog Bites take care of that craving! Every time! I used to use regular sized hot dogs but now I just go right for the jumbo or large sized hot dogs! These Cheesy Bacon Hot Dog Bites are perfect as a snack, for movie night, or as a meal! 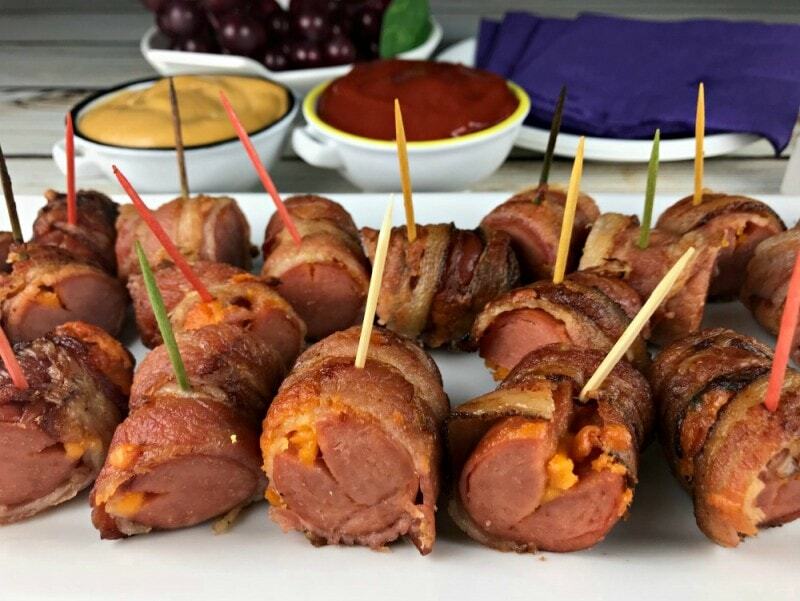 Cheesy Bacon Hot Dog Bites are a fast an easy way to really enjoy a hot dog without the bun! I have been trying to eat less bread, every chance I get while still enjoying my favorites! This recipe requires no bread at all, just some of your favorite traditional hot dog toppings for dipping or nothing at all! They are so delicios either way! 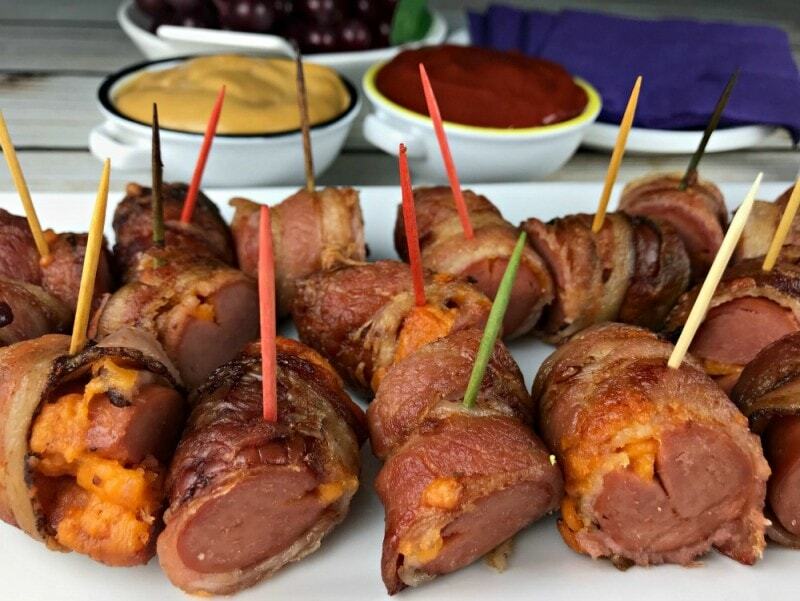 Lately I have been using chicken hot dogs to make these Cheesy Bacon Hot Dog Bites but honestly, any kind will do! My husband Ken always makes these with beef and my son uses any kind he can find! No matter which type you use the timing will remain the same! I couldn’t help but make a video for our Cheesy Bacon Hot Dog Bites. Take a peek below! Preheat your oven to 425 degrees. Prepare a rimmed baking sheet with tinfoil and a rack lightly coated in cooking spray. Set aside. Slice cheese, from the narrow edge, no more than 1/4 inch thick. You want both of your cheese slices to fit the length of your hot dog. Make a small cut into the long side of each hot dog. You want to slice more than 3/4 of the way through each hot dog, from end to end but not going over the end to try and prevent the cheese from running out. It is kind of like cutting a long pocket into each hot dog. You will do your best and sometimes there will be less cheese in some and more in others. There is always some leakage. Don't worry though these little bites are delicious! Press each cheese slice or chunk inside each cut in the side of each hot dog. Starting at one end fold bacon slice over top of the end and then start to wrap your hot dog towards the middle. Then start at the other end and wrap towards the middle again. Keep track of which side your cheese is on and try and secure the bacon with the toothpick so you can tell where the cheese is. This way when you bake them you will know how to place them on the rack so the cheese is facing upwards. I hope that makes sense! Wrap each hot dog tightly with the bacon. You can use 2 or 3 slices. If you use 3 slices the cooking time could be a bit longer. This will depend on how thick your bacon slices are and how much you love bacon! Just remember to overlap each slice and pull the bacon tightly around each hot dog. Place wrapped hot dogs on your prepared pan with the toothpicks facing upwards. Bake at 425 degrees for 50-60 minutes. Depending on how crispy you like your bacon. Remove hot dogs from oven. Place two toothpicks, evenly spaced on either side of the toothpick in the center. Grab a knife with a serrated edge (or a bread knife) and saw your way between each toothpick so you end up with six bites, each attached to a toothpick. Repeat until all of the hot dogs are sliced into bites. If you want to create smaller bites just add more toothpicks before you start to slice! Place on a serving platter and enjoy!